News about the purge of gay people in Chechnya, a republic in Russia, first reached international newsstands in April 2017. At that time, over a hundred members of the Chechen LGBTQ community had been detained, tortured, and killed by local policemen. The Russian government has continuously stalled the investigation into this matter, and to this day no officials have been prosecuted for these crimes. Kosta Karakashyan, a Bulgarian-Armenian choreographer and dancer, worked with the organization Voices for Chechnya, now simply known as Voices, to offer support to the victims. To engage society on this matter and to ultimately put pressure on the Russian government, Karakashyan looked to his craft. 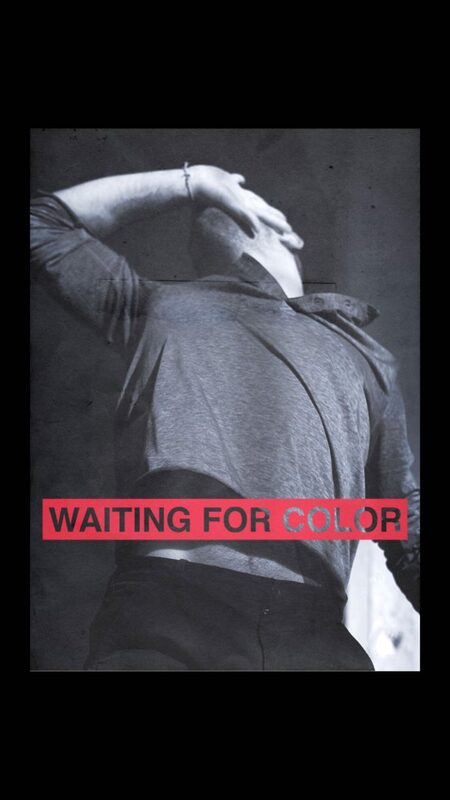 His creation, titled “Waiting for Color,” was released on August 27. “Waiting for Color” is a short dance documentary film that shows solidarity with those impacted by the persecutions by focusing on the brutality and despair of the victims during their detainment. Through it, Karakashyan urges us to be compassionate viewers and proactive members of society, and to donate and provide support to the local LGBTQ community at www.lgbtnet.org. “Waiting for Color” is performed by its creator in a six-and-a-half-minute long monochrome dance piece. Set in an eerie Brooklyn warehouse, the film’s primary emotions are paranoia and hopelessness. When I spoke to Karakashyan, he told me that one of the most terrifying things for him about these persecutions is that undercover police men tricked victims into getting caught. It is this idea of surveillance and insidiousness that shapes the film’s overall ambiance. The choreography is marked by jagged repetitive movements which do not build up to anything, but rather disintegrate to the echo of biting lines like “we have proof that you’re a fag. You bring shame to our people. You shouldn’t exist.” The soundscape of the work, composed by Julien Leitner, is comprised of hollow music and distorted thumping sounds which gradually descend, as if to evoke a slowing heartbeat. Yet, the choreography is more directly led not by the sounds but by the victims’ testimonials. Collected from 33 survivors and made public by the Russian LGBT Network, the testimonies narrate the work throughout. As the heart and soul of the documentary, they are also the main conductors of the movement in the piece. In fact, Karakashyan’s dance is at times a reflection and at times a reaction to the lines that are being read, blurring the boundaries between narrator and character. One scene follows the testimony of a Chechen man who was arrested and tortured on the suspicion of being gay. It constitutes a detailed inspection of the suspect’s clothing at the time of the arrest. Hissing into the speakers in a sinister murmur, the victim lists the inventory of the leather bag he was carrying, which ranges from “a moist towelette to a manicure set.” These possessions, harmless in the hands of Chechen women, are dangerous when carried by local men; they become the victim’s scarlet letter. 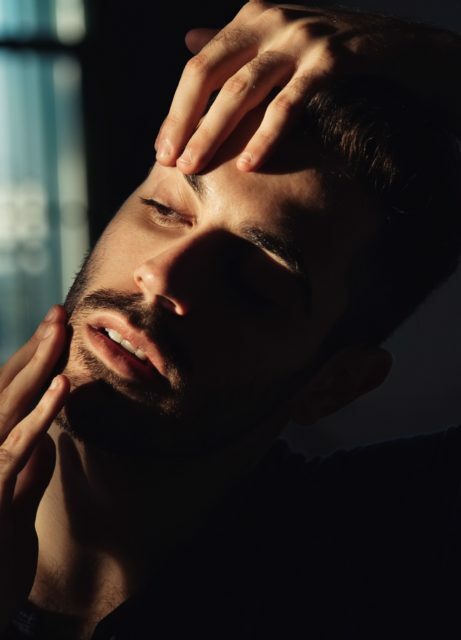 It is as if his forehead is branded with the word “FAG.” Once exposed, the victim is arrested and disarmed of all belongings which propagate homosexuality. Then the torture ensues. Yet, the choreography during the reading of this testimony does not reflect the idea of powerlessness. On the contrary, as the victim reveals the reason for his arrest, Karakashyan tightens his body into a poised, defensive stance, as if preparing for battle. He slows down and tenses his muscles, bringing the focus to his posture. While the speaker lists his belongings and draws ever closer to his verdict, Karakashyan’s body assumes a position that exudes strength. Here, he seemingly takes on the role of a toreador inciting a bull before plunging the spear into its body. The imagined bull is the cop, and the bullfighter the gay man. In this way, the victim’s feminine handbag is weaponized, and the reason for his detainment is turned into a source of power. This is not an attempt to romanticize or to negate the harsh reality of the Chechen persecutions, or of the countless cases of brutality against members of the LGBTQ community around the world. Instead, Karakashyan’s jarring choice of movement here carries tenacity, and it proclaims our right to fight injustice. A sunlit background spurs out of the past monochromatic one, creating a disconnect between the grim reality and the hopeful future as envisioned by the dancer-artist. Karakashyan said that he wanted to put an optimistic spin on the work by using the image of a rainbow as a symbol of color and hope. Facing the macabre becomes inevitable in the following scene, as it depicts a physical embodiment of torture. Here, the sounds and background whispers intensify and are made incongruent to the jolted, writhing movements of the dancer. Karakashyan is fully immersed in the torture dance scene to the point of losing control. Although physical and psychological pain haunts the entirety of the film, this seemingly novel freedom and volatility of the movement give them a new form. The choreography in this scene emulates electrocution, and the pain from the torture practice is made even more visceral by Karakashyan’s gasps, shrieks, and his slicing movements which look like failed attempts at escape. Suddenly, he wrenches himself out, making his escape. This episode takes the premise of the film to another plane, one of colour. A sunlit background spurs out of the past monochromatic one, creating a disconnect between the grim reality and the hopeful future as envisioned by the dancer-artist. Karakashyan said that he wanted to put an optimistic spin on the work by using the image of a rainbow as a symbol of color and hope. He hopes that it is only a matter of time until people from all around the world can express themselves freely, and that until then, “we are all in the waiting room together; waiting for color.” He admitted that there is no positive outcome or conclusion to this case yet, but that the best thing we can do is to evacuate the victims and help them start a new life somewhere else. Rainbow Railroad, a Canadian organization fighting for the rights of LGBTQ folks around the world, has helped immensely in minimizing the harm done to Chechen members of the community. Their support lies in orchestrating the relocation of a number of victims of police brutality. Karakashyan’s optimism for the situation derives from the fact that the number of police searches on members of the LGBTQ community in Chechnya decreased when this issue was finally addressed internationally last year. Although we are still far from eradicating culturally-ingrained violence and hatred around the world, Karakashyan is adamant that staying vigilant and putting greater international pressure on the government to start an official investigation into the state’s abuse of power are crucial components to seeing tangible change. Waiting for Color is available to watch on Karakashyan’s artist facebook page at https://www.facebook.com/kostakarakashyan/videos/308395116655076/ .